A former colleague of mine is working on some health system initiatives to deliver community-based care. They’re working to identify the disease states that have the most potential to benefit patients who frequently wind up in the emergency department due to lack of care for chronic conditions. While they sort through the data, they’re already partnering with a set of local charities to address basic issues such as food insecurity through school-based food pantries. For many of the children in their target communities, the federal school lunch program may be providing the only balanced meal of the day, and this changes dramatically when schools let out for the summer. They are also working to provide clothing including school uniforms, and have found additional challenges with families who may receive uniforms but don’t have access to facilities to launder them. The health system is working under the hypothesis that they’re not going to be able to drive the needle on patient outcomes unless they address some of the basic needs in the community, in partnership with organizations already working in that direction. The health system is already targeting adult populations with a mobile unit that performs diabetes outreach, but they’ve found that many of the patients that come to the mobile unit are already diagnosed and have physicians, but visit the van for testing that they feel is more convenient than going to the doctor’s office. 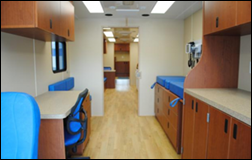 There’s a risk of care fragmentation in that scenario, and the mobile unit has had to change its protocols to shift from strictly performing screening to adding care coordination and communication with primary care physicians. In looking at the next phase of community-based care, they have completed an amazing amount of analysis with emergency department records, community health clinic records, and data from state registries. She told me about a couple of organizations that they have researched as potential models for their programs, and I took a peek at one of them. There is truly some amazing work going on that goes right along with the transformation to value-based care, but aren’t readily visible to many of us in the trenches. One of them is Mobile Care Chicago, which deploys vans to address childhood asthma in underserved communities. Their community health workers partner with schools to screen children for asthma symptoms, then reach out to the parents of those children to consent for care. Those who opt in receive an examination and often a diagnosis of asthma. The van visits schools monthly and tries to ensure the patients have continuity of care with providers over time. Patients are seen an average of four times during the first year, and those who are not showing progress are referred for home visits. The cost savings data is pretty impressive, especially considering that some children with asthma might visit the emergency department more than a dozen times in a year, often without a formal diagnosis of asthma or a commitment for follow-up. Missed school days are down; emergency department visits and admissions are down as well, from 36 percent to 3 percent. The cost savings is impressive – it costs $900 annually to deliver care via the van, versus $15,000 for children who have to be hospitalized. The potential savings to local health systems is over $6 million. Mobile Care Chicago also offers a dental van and a general children’s health van in addition to the asthma van. I’m curious what systems they use for documentation, to ensure the patients have a comprehensive health record and to make sure data is available for continuity purposes if a patient would arrive at the emergency department. There are always challenges when public and private organizations are involved, and sometimes data ownership and coordination become barriers. Years ago, I worked on an HIE project where various community clinics couldn’t agree on data sharing and governance, resulting in a structure that resembled more of a data vault than something that was truly interoperable. Providers could view data from other facilities but couldn’t download it or incorporate it into the clinical chart, making it less attractive to use especially given the separate login and clunky web interface. There were always battles about how new interfaces were going to be funded and whether new member organizations would be allowed to submit their data for viewing. Based on recent projects I’ve seen, those kinds of challenges are still out there. I’d be interested to hear from clinical informaticists that are working with organizations like Mobile Care Chicago on how they leverage technology to make this all happen. Are they using available public health data from sites like HealthData.gov or gathering their own from local providers and facilities? How do they decide what communities to target? Do they change their outreach strategies based on modeling versus current data trends? Is it better to expand over a wider geographical area or to add more depth to services in areas that are already being served? In looking at potential models for our community, there will have to be a fair amount of consideration of the mobile approach versus trying to develop school-based clinics. I’m sure there are a multitude of legal and regulatory hurdles that will need to be fully evaluated for either option. The Mobile Healthcare Association helps connect groups interested in mobile clinic operations, and offers regional coalitions for shared learning along with special interest groups for mammography and vision care providers. The organization advocates for mobile health delivery organizations and hosts an annual forum for members. They also help connect organizations with other members who might be selling their pre-owned clinics, and provide tips on selecting a diesel- or gasoline-powered vehicle. Those are entirely new dimensions for healthcare delivery that I hadn’t even considered. Bringing healthcare to the people isn’t a new concept, but it’s something to think about every time a hospital builds a shiny new addition. Are we really serving patients better by expanding tertiary referral centers versus considering alternate delivery options such as mobile, school-based, or workplace clinics? It should be fairly straightforward to analyze the data over the next few years and determine who really is getting the best bang for their buck. Are you involved in the delivery of mobile healthcare? How does your organization leverage information technology? Leave a comment or email me.